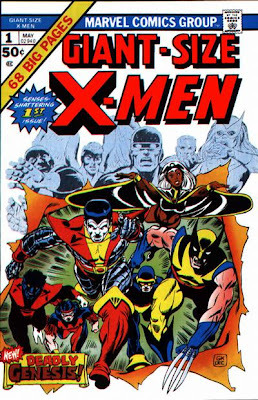 Original cover by Gil Kane and Dave Cockrum; Marvel 1975. Noah Medlen's website is here. 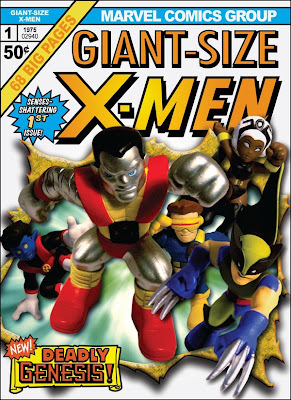 Colossus was always front and center on these early X-men issues. They were positioning him to be the new "Thing" (who was one of Marvel's most popular characters). Poor Peter just didn't have an interesting personality (plus he was Russian in the cold-war Reagan era). Of course we all know that Wolverine surpassed them all in the popularity department. By making the photographed characters sculptures, they actually look tiny (which is a great contrast to the Giant-Size title). Anyway, nice job Noah...it looks like a lot of work went into this. I only wish they were tearing out of the actual comic...but that might've set you back a pretty penny and offended the mint-condition folks out there. Could be better. Without Thunderbird it's not really a complete "cover," to me. At Anthony V- I get what you're saying about having a Russian main character during the cold war, but Giant-Size came out while Ford was in office. Most likely he was "conceived" at the end of the Nixon era. Reagan wasn't president until '81, post "phoenix saga". Sorry to nit-pick, your cold war comment is obviously valid. Also, I doubt these are "sculptures" rather than toys. Note Cyclops visor. That would be the reason for the lack of a thunderbird as well. I don't know if toy-biz or whoever would have made one. Anonymus, that's a brilliant idea! One could do some awesome stuff with collage/multimedia stuff. In fact there is a machine man cover on here that used photography and is pretty bloody cool.